I could spend all Winter in this cozy, oversized sweater! V-neck sweaters are my absolute favorite. They are elongating and so comfortable to wear. 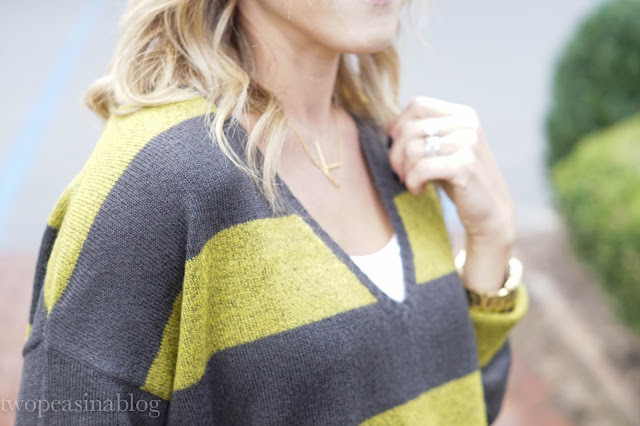 I love the big, bold stripes on this sweater and it's available in a few stripe colors. Yesterday, while out running a few errands, I kept hearing Christmas music in the stores. I found myself dancing through the store and singing along. While I haven't decorated at home yet, since I'm hosting Thanksgiving, I'm loving all the Christmas sights and sounds around town. Speaking of Christmas - we have an amazing giveaway at the end of this post. Be sure to read down and enter to win! Black Friday and Cyber Monday are just around the corner! In celebration of the two biggest shopping days of the year, we've teamed up with a bunch of other bloggers to make sure that you'll be ready to shop. This giveaway ends on 11/23 and the winner will be announced on or before 11/25. You must be 16 years (or older) to enter. International entrants welcome. Please keep in mind that you cannot complete more than 66 entries and that we can tell if the same person uses multiple emails to enter. All entries will be verified, so make sure to hit 'FOLLOW' or 'LIKE' to complete each entry. I've been wearing them on repeat lately! It's amazing how much they go with and are so comfy! Thank you so much! I love these big, bold stripes. It was perfect for a day of exploring while on our weekend getaway. Love this sweater! It looks so cozy and the colors are so different! Love the sweater...slouchy ones are my fav;) And the shoes, too! Happy Thanksgiving + Early Black Friday Sales!